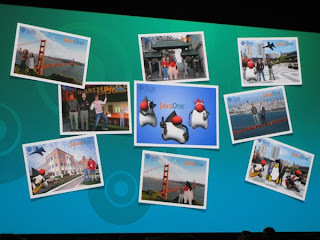 During James Gosling's keynote (the Toy Show), he showed a screen when people's shots with "digital duke" (they took our photos on a green screen, then you could put custom backgrounds on it). 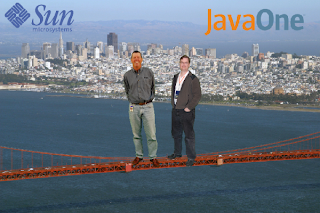 I played around with mine with the little tool they had, and ended up putting myself and Scott McNealy standing on the Golden Gate Bridge. Imagine my surprise when I saw my picture up there on the big screen!